If you want a showstopping, delicious dessert that is not too complicated to make, then a French Strawberry and Vanilla Charlotte will do the job perfectly. This desert makes not only a beautiful presentation but also is filled with a creamy vanilla custard and oozes oodles of fresh, juicy strawberries plus seasonal berries as you wish. The Charlotte does need plenty of chilling time to firm up the custard for serving and once ready makes a lovely dessert for summer lunches and dinners, special occasions and treats. This recipe is a simplified version of the classic layered Charlotte, and every bit as delicious. Toss the hulled strawberries with the sugar and lemon juice, and allow them to marinate in the refrigerator for anything up to 24 hours. The fruit will give up some of its juices in the process. The following day, in a small saucepan, warm the milk over low heat until it is just hot enough to steam. While the milk is warming, whisk together the egg yolks, sugar, flour, and cornstarch until the mixture is completely smooth. Once the milk is steaming, add half of it, continuously whisking, to the egg mixture. Add the milk and eggs back into the hot milk, continue stirring, and heat it for 1-2 minutes, until the custard reaches 170 F on a digital thermometer and is very thick. Immediately, remove from the heat, stir in the vanilla extract, and put to one side to cool then put into the refrigerator to chill down before filling the cake. To make the Charlotte, line a Charlotte mold by pressing the ladyfingers into the side of the pan in an upright fashion; this can also be done in a springform pan if you do not have a Charlotte mold. Spoon the chilled custard into the center of the pan, spreading it out to touch the ladyfingers, you will have to do this gently so as not to disturb them. Smooth the surface of the custard. Chill the Charlotte in the refrigerator for at least 4 hours. To serve, run a knife around the edges of the mold to loosen it then gently and carefully invert the Charlotte onto a chilled serving plate, and lift off the mold. 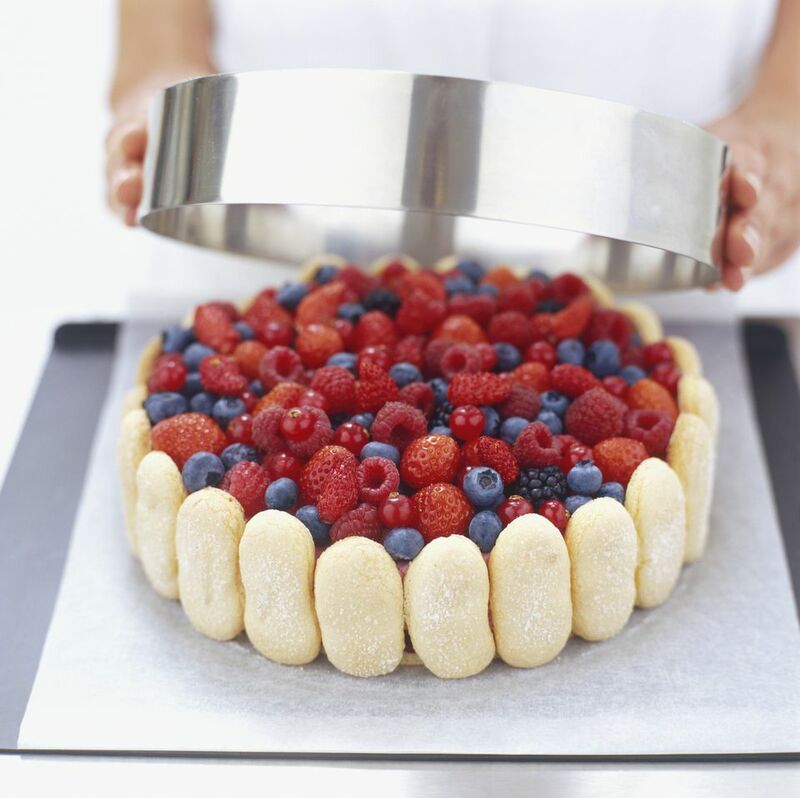 Using a slotted spoon to drain the excess juices, spoon the reserved strawberries - and other berries if using - over the vanilla Charlotte and serve the dessert chilled. If you have sufficient juices leftover, strain through a fine sieve and serve alongside the Charlotte.